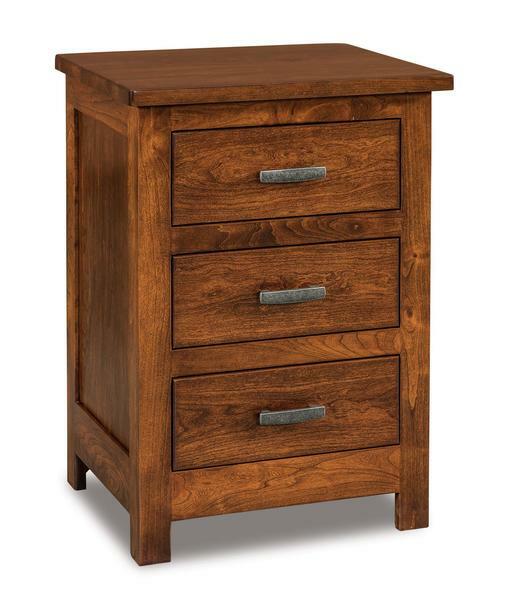 Place the Amish Flush Mission Three Drawer Nightstand by your bedside for the perfect complement. Standard with three dovetailed drawers on full extension drawer slides, you will be able to access your night time essentials with ease. Place your alarm clock, flashlight, electronics, and more in the spacious dovetailed drawers. Check out some of the premium features available with this solid wood bedside table below. Get in touch with one of our specialists if you have any questions or concerns regarding this solid wood nightstand or one of our other products. Our toll free number is 866-272-6773. The bedroom furniture I ordered and received from DutchCrafters so far exceeded my expectations that I’m actually taking time to write this review (doesn’t happen too often). It is rare nowadays to actually be more than pleased with any purchase made, online or in-store. I went with DutchCrafters because I wanted a solid wood product that was made by people with pride in their workmanship. I definitely made the right choice. I was waiting for this delivery before ordering more for my new home. I wanted to confirm the workmanship promised, and have decided to order more furniture from DutchCrafters because of my extreme happiness with the furniture delivered. The delivery company was professional and the delivery and assembly was exceptional. That sealed the deal!